Making of handmade paper from rice straw is a good environmental business idea. Rice straw is very abundant in the country especially after harvest. Instead of burning it, rice straw can be turn into usable and economical handmade paper. Separate rice stalk from the leaves and panicles. Out these into 5-7 cm pieces and then wash with water. Pulping Boil stalks in 2.0% sodium hydroxide solution using liquor to material ratio of 10:1 for 2-3 hours or until stalks become soft. Immediately after boiling, drain the stalks and transfer these into the screened bottom box Wash stalks thoroughly with water. Pound stalks with a wooden mallet. Then, screen the pulp on double-decked screen-bottom box by running pulp under high water pressure. Thoroughly wash the pulp with water after each stage. 1. Prior to sheet forming, allow the pulp to swell in water at 2% consistency for 30 minutes. 2. Drain the pulp and form this into balls. 3. Beat the pulp with a wooden mallet until it is free of lumps when suspended in water. 4. Transfer the beaten pulp into the paper vat. 5. Add water to the desired consistency of the slurry. If you desire thin paper, add more water; if thick paper, put less water. 6. Add paper additives: rosin size (1%) and alum (2%). 7. Dip the mould fitted in the deckle into the paper vat at an angle, straighten out and lift it to catch an amount of the solution on top of the screen. 8. Tilt the mould and deckle back and forth to the maker side and throw excess slurry back to the paper vat. 9. Shake the mould and deckle. 10. Tilt the mould again back and forth until most of the water comes out through the screen. 11. 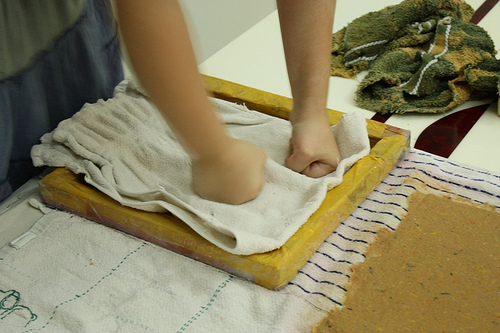 Then separate the mould from the deckle and lay it on the pieces of blotting material like cheesecloth. 12. Cover this with another piece of blotting material. 13. Pressed with a roller, slowly separate the screen from the street. 15. Remove the blotters and hang the sheet to dry. The handmade paper produced is creamy white, 0.43 mm thick. It is suitable for special paper products like greeting cards, calling cards, and other novelty paper items. I did a handmade paper in the house. I must say that even comes out very cool these methods. It's easy just need to do them well. Meuse add to them a little gruel for wood to make it more durable. It can be done in several ways – I did this unusual http://www.open-youweb.com/how-to-make-paper/ recommend this first. Thanks for the nice post.